In the season 1991/92, PSV Eindhoven confirmed the leadearship in the Dutch football winning the championship with the star player Romario. Top scorer of the season was Bergkamp (Ajax) with 22 goals. The album Panini Voetbal 92 starts with two action stickers dedicated to Ajax and the title owner PSV. Then each team is shown in alphabetical order with 12 stickers of players displaced over two pages. The number of stickers is thus not very high, but all stickers are large size with glossy surface. The team photos of the Eredivisie (PPT Telecompetitie) are shown on four pages with a total of 18 stickers. 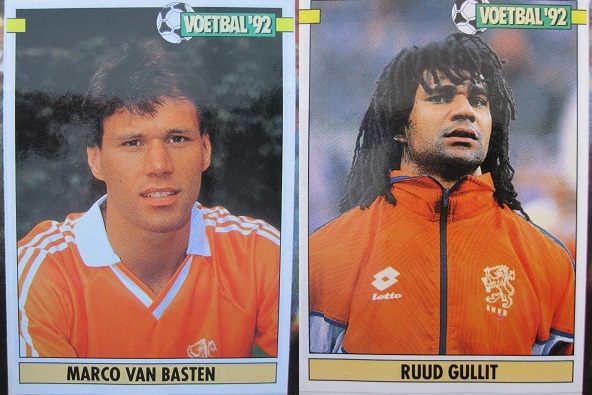 Then there are two pages with 12 stickers of players of the national team (Oranje '92). Among them Koeman, Gullit, and Van Basten. The album continues with 20 stickers of team photos of the Eerste Divisie clubs. The album concludes with the list of the 300 topscorers of all times. 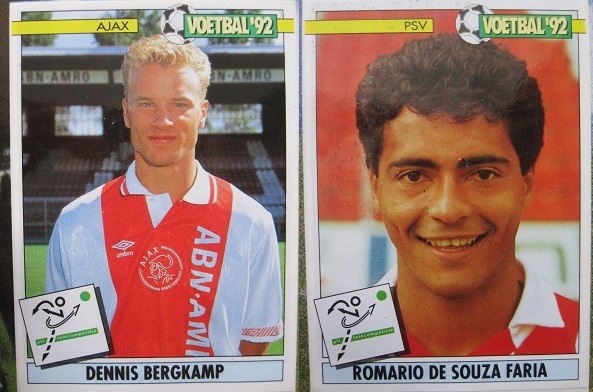 In this section there are two stickers of the topscorers of the season 1990/91, Dennis Bergkamp and Romario. 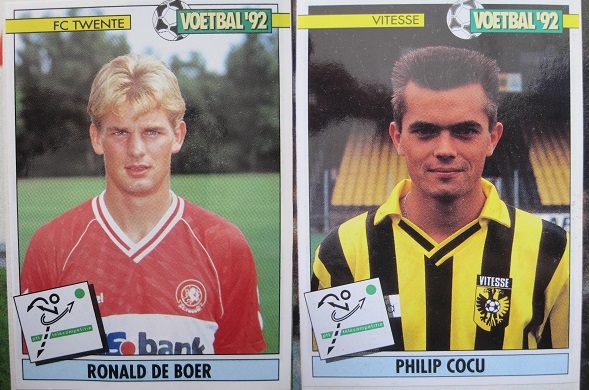 The famous Ronald de Boer (Twente) and Philip Cocu (Vitesse) at the beginning of their career. They are both born in 1970.